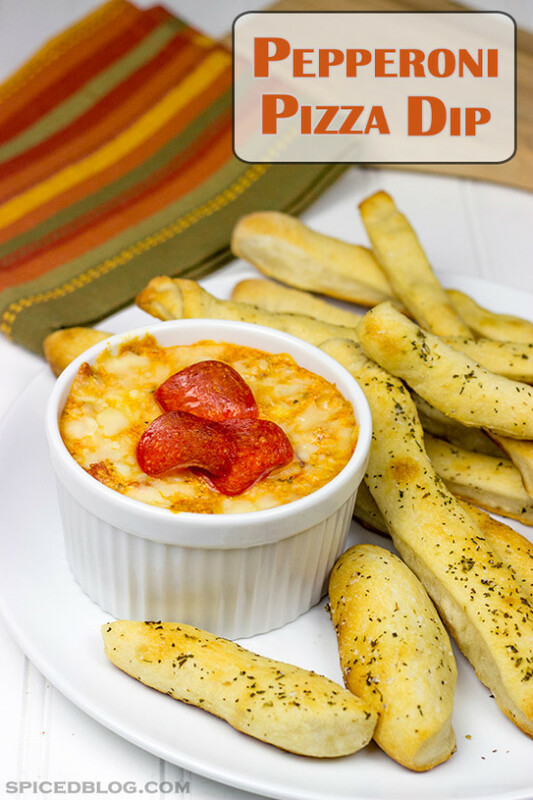 This Pepperoni Pizza Dip is a fun appetizer to include on your Super Bowl snack table! I can’t imagine watching a football game without pizza. It’s almost like pizza was created for football. Or maybe it was for beer…hmm, I’ll have to think about that one later. I’m a huge college football fan, and my wife and I make homemade pizza every Saturday night before watching the LSU game. I’m not gonna lie…this tradition is one of my favorite events of the week! Sadly college football season is over, but there’s still one kinda big football game left this year. Yup, the Super Bowl! Although I like college football more, the NFL is still fun…especially when it’s the biggest game of the year! In keeping with the football and pizza theme, I created this Pepperoni Pizza Dip for this year’s Super Bowl. It’s basically all of the delicious fillings from inside a calzone served with pizza dough cut into dipping sticks. Um…yes, please! 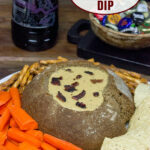 A similar dip showed up a friend’s Super Bowl party last year, and it was one of my favorite appetizers there! So it’s no surprise that this Pepperoni Pizza Dip is showing up in my house this year. 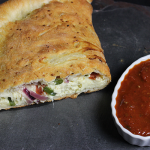 My wife and I occasionally make tasty calzones at home, so I pretty much just shifted those ingredients around a bit to create this dip. After all, it’s the Super Bowl, and anything less than 7 dips on the snack table is entirely unacceptable! 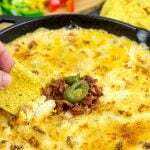 What are your favorite gameday dips? For dippers, I made a batch of homemade pizza dough, but you could certainly use store-bought dough instead. Either way, you just brush the dough with an olive oil-Italian seasoning mixture before baking it! I’ve included this in the recipe below, and I typically also throw in a generous pinch of kosher salt, too. The extra seasonings baked into the crust make these dippers good enough to eat just by themselves…but then add in the warm Pepperoni Pizza Dip and you’ve got a magical combination. So magical that it’ll disappear off of your snack table in just minutes! For more fun pizza ideas, check out this Homemade BBQ Chicken Pizza or these 5 Fun Twists using DiGiorno Pizza. In a medium bowl, combine pizza sauce, ricotta cheese, mozzarella cheese, 1/4 cup of the Parmesan cheese, pepperoni, onion and jalapeno (optional). Stir until fully combined. Pour mixture into a small oven-safe baking dish; top with remaining ¼ cup of Parmesan cheese. Bake at 350°F until hot (time will depend on size of baking dish, but estimate 15-20 minutes). Remove dish from oven and cover with aluminum foil to keep warm. Increase oven temperature to 450°F. While the Dip is baking, combine the olive oil, Italian seasonings and kosher salt in a small bowl. Roll both pieces of pizza dough into large rectangles; brush dough evenly with the olive oil mixture. Garnish the warm Dip with fresh basil (optional). Serve hot. Mmmm. Breadsticks always look good. I bet garlic bread sticks would work for the cheesey dip too! Yup, come on over! I’ll have a fresh batch of this dip ready to go! This looks so so SO good. And it looks so easy! I will definitely be making this on Sunday!!! Thanks so much, Wendy…it’s definitely one of my favorite appetizers for the big game! Enjoy!! Game food = pizza! Totally agree. 🙂 I love it in a dip form. Pure genious! Thanks, Tina!! I hope you enjoy the big game this weekend!